Tesla CEO Elon Musk took veiled shots at the Securities and Exchange Commission and federal prosecutors in a tweetstorm on Friday. The US Justice Department's investigation into whether he and Tesla misled investors about production of its Model 3 vehicle is "total bs," he said. The $20 million fine he had to pay over his "funding secured" tweet was "worth it," he added. The tweets come after Tesla agreed to set guidelines for and oversee his use of Twitter. Elon Musk may have settled a suit filed against him by the Securities and Exchange Commission, but he's still tilting at federal regulators. In a long series of tweets on Friday, Tesla's CEO called an investigation into the company by the US Justice Department "total bs" and said that the tweet he posted that led to the SEC charges against him was "worth" the $20 million fine had had to pay to settle them. He also poked fun at the SEC's mandate as part of his settlement to get him to be more responsible with his tweets. In response to a tweet from another user suggesting that he had turned over a new leaf, that he was acting the part of running a company that had finally matured, Musk tweeted: "Clearly, you're not reading my twitter." Musk's tweets in August related to potentially taking Tesla private got him and the company in trouble with the SEC. In his posts, he stated that he had "funding secured" to take the company private. The SEC later charged that statement and other related ones were false, and that Musk knew they were at the time. After initially rejecting a settlement offer — and seeing the SEC file civil charges against him — Musk settled the suit. As part of the settlement, Tesla had to pay a $20 million fine to the SEC and agreed to put in place new guidelines to oversee Musk's social media use. If his tweetstorm was any indication, Musk wasn't the slightest bit chagrined by the settlement, which also will require him to step down as Tesla's CEO. As part of a back-and-forth on the site with other users about the merits of Twitter and how relatively few followers "like" good tweets, one user asked him what the ratio of likes was for his "funding secured tweet." 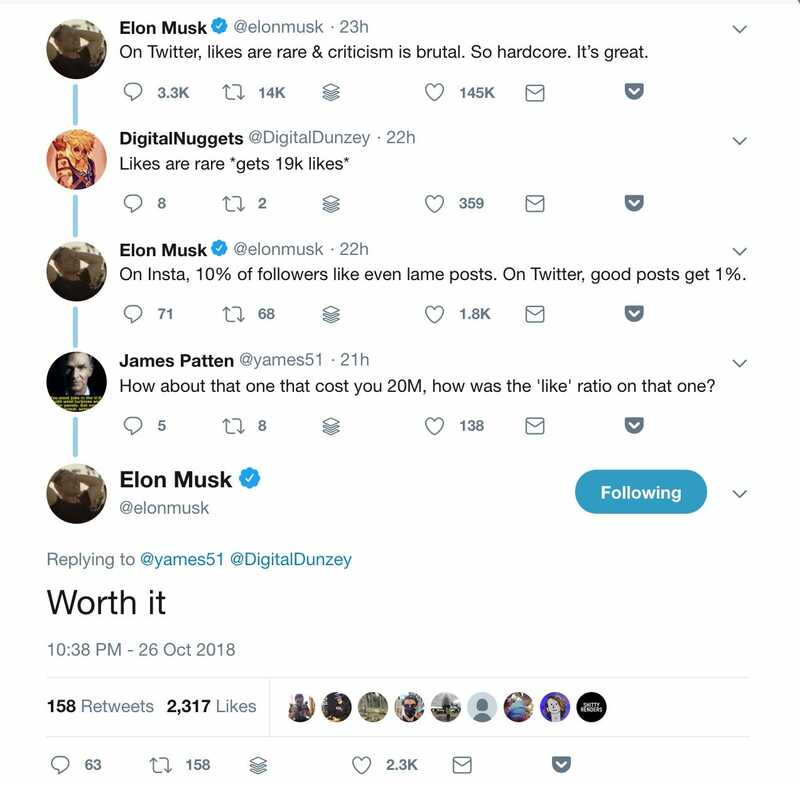 Musk's two-word response: "Worth it." But Musk didn't stop there. That evening, The Wall Street Journal published a report saying that the Justice Department is ramping up its investigation into Tesla over whether Musk and the company misled investors over production issues related to its new Model 3 vehicle. Musk had said as early as February of last year — months before Tesla started making the Model 3 — that the company planned to be manufacturing 5,000 of the vehicles a week by the fourth quarter of 2017, comments he echoed that July. In reality, the company didn't hit that 5,000 vehicle a week target for the first time until the end of June this year. Commenting on the Journal's article Friday night, Fox Business Network correspondent Charles Gasparino tweeted that proving that Musk and Tesla misled investors would be "really difficult." "Exactly," Musk responded to Gasparino. "This is total bs." Exactly, this is total bs. What part of “production hell” sounds like a sure thing!? Musk even seemed to invite a dig through documents via a Freedom of Information Act request in an effort to prove his case. "The FOIA on this will be solid gold," he tweeted. "Can't wait." The FOIA on this will be solid gold. Can’t wait. But that wasn't all. Earlier, another Twitter user charged that the substance and timing of the Journal's article was "purely meant to distort [Tesla's] stock and harm investors" and questioned why the SEC wasn't looking into it. At the end of his tweetstorm, Musk announced he would be "signing off Twitter for a few days."